Interested in keeping up with the latest catheters available on the market? 180 Medical is always ready to share the scoop on the newest products with you, and today, we’d like to introduce you to the recently released line from Hollister. The Essentials line is manufactured by Hollister, a global manufacturing company with a goal to provide top-quality products to improve the lives of those who use their supplies and to serve the needs of healthcare professionals as well. They currently provide products to over 90 countries, and the company was originally created in 1921. Essentials intermittent catheters are 100% latex-free medical-grade PVC and come in an easy-open package. Each catheter features fire-polished eyelets to create a smoother insertion and help minimize any trauma or irritation during catheterization. These eyelets are also offset to maximize flow of urine. The catheters also feature an enhanced grip on the flexible color-coded funnel for easy handling. The Essentials line products are available in straight tip with lengths of 6 inches (female length) and 16 inches (male length) and in coudé tip (available in male length only). You can see an immediate difference in the funnel shape and size between the two. While the traditional line’s funnel is smooth, the Essentials catheter funnel is more flexible and features an enhanced grip for easier handling. 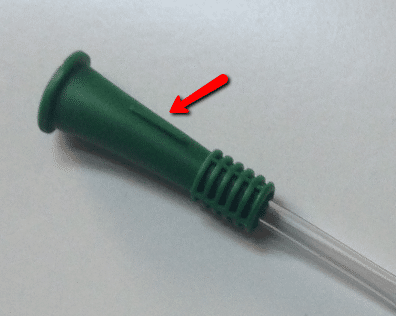 The Essentials coudé catheter’s funnel also features a guide notch to indicate the coudé tip’s position during insertion. Which of these Essentials products does 180 Medical carry? 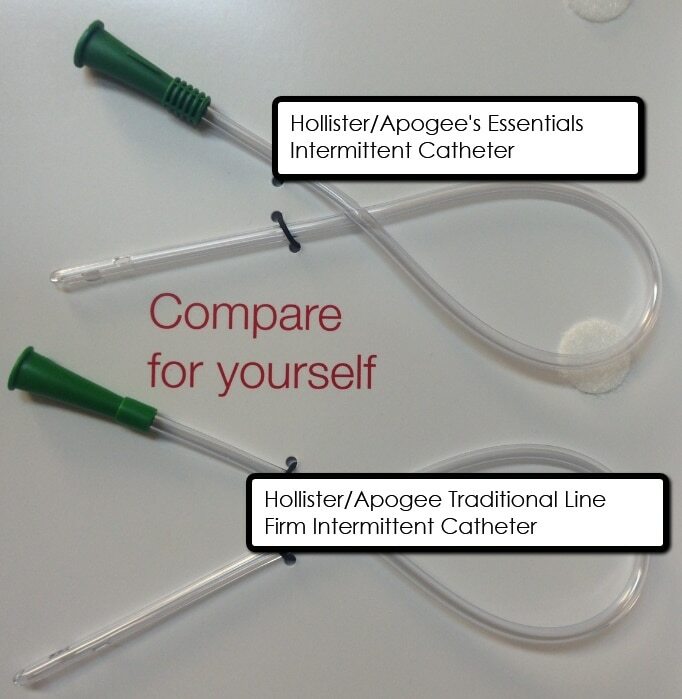 We are proud to carry the entire line of Hollister Essentials intermittent catheters. Essentials coudé catheters are available in sizes from 8 Fr to 18 Fr. Essentials straight tip intermittent catheters are available in female length (6 inches) from 8 Fr to 14 Fr, pediatric length (10 inches) from 6 Fr to 10 Fr, and male length (16 inches) from 6 Fr to 18 Fr. If you’re interested in trying out one of these Essentials catheters, contact 180 Medical by filling out our online inquiry or give us a call at 1-877-688-2729 to speak to one of our highly trained, friendly specialists.